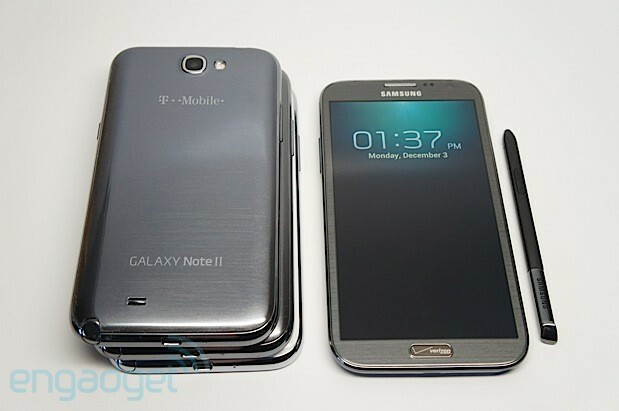 Samsung Galaxy Note II for Verizon: what's different? The Galaxy Note II is a big phone that has attracted an even bigger following: Samsung shipped over 5 million units in two months, even before the holiday shopping season commenced in full force. And we don't expect the company to slow down either -- now that the device is available worldwide and on all four national US carriers (not to mention a regional player as well), Samsung's likely to pick up the pace exponentially. We've already painstakingly reviewed the Note II in all its glory -- twice, actually -- but Verizon's particular variant has a few key differences that are worth noting. What kind of carrier "enhancements" and other goodies can you expect as a reward for your 300 hard-earned dollars? 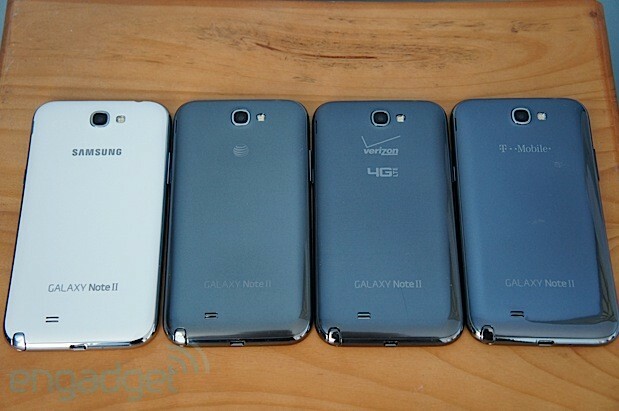 How does the Note II match up against the rest of Verizon's lineup? Follow us past the break and we'll give you the full scoop. 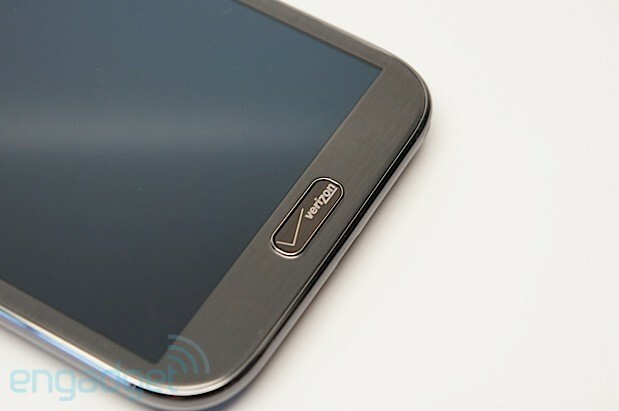 Verizon's Galaxy Note II is the final US variant, marching onto the scene long after the rest of the group. Regardless of whether the carrier was hoping to make a grand entrance by taking extra time to push its version out, it's certainly ruffled quite a few feathers since it arrived. It seems that having the largest subscriber base in the country gave the network more leverage at the negotiation table, as the handset is littered with Verizon branding, both on the device itself and in the software. 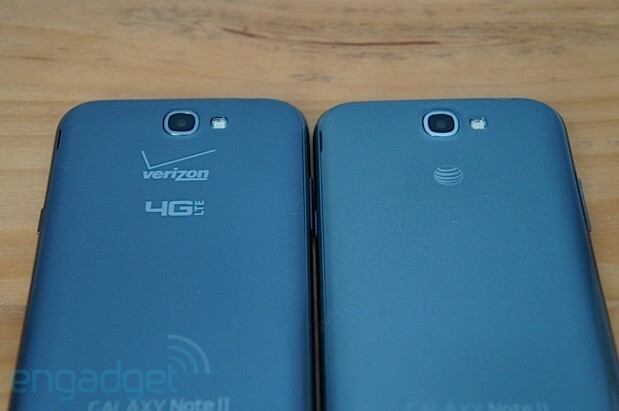 First, Verizon took way too many liberties in altering the phone's design. The home button, once a sacred edifice immune to the effects of any type of branding, now houses Big Red's signature checkmark logo, and the company even found a way to cram its name in this tiny space. Not only does it stand out like a sore thumb, but the logo looks like the victim of a tragic accordion accident, scrunched up and out of place. Flip the phone over to the back and a larger version of the very same logo (along with the usual Verizon "4G LTE" symbol) is prominently stamped on the back cover. Put it side by side with an AT&T Note II and its globe is easily eclipsed. Underneath the back cover you'll notice something else that separates this phone from the rest of the pack (save Sprint's version): there's only one pair of gold contacts (for NFC use). Meanwhile, Verizon chose not to include contacts for inductive charging. This is a huge head-scratcher, since the company has been a strong advocate for wireless charging over the last two years. To some extent, these shortcomings can be rectified. Special home button stickers are available for purchase, you can replace the back cover with a generic Note II version and we even found a YouTube video showing a way to hack your phone to make inductive charging work. (It's not for the inexperienced, so don't try this at home kids.) Still, all of these fixes require additional time, money and effort. All that just to bring it in line with other Note II devices. The differences don't end there. Big Red thankfully included support for Samsung's Multi-Window feature, a new multitasking option that earned our praises in previous reviews. When holding down the back button, a sidebar appears with several apps included. Simply drag and drop two of these apps to either half of the screen and you'll be able to use both programs at the same time. Unfortunately, Verizon's take on the feature came without support for Gmail, Google Maps, YouTube or Google Talk -- all of which are offered on the global and Sprint versions. This comes as a huge disappointment, especially since we'd prefer to use those apps in Multi-Window mode quite frequently. To be fair, Verizon has stated that it will soon be releasing an update that adds support for these apps -- third-party support is now offered as well, so we hope to see developers take advantage of the feature -- but we have no way of knowing when we can expect to see it. Other than that, you'll have to wade through the usual barrage of preloaded apps, including the full Amazon suite (which comprises six apps) and services like VZW Navigator, Viewdini and NFL Mobile. Fortunately, most of these can be disabled. Internally, you can expect the same 1.6GHz quad-core Exynos 4412 SoC found on other Note II devices, along with 2GB of RAM, 16GB of built-in storage, a 3,100mAh battery, 8-megapixel rear camera with 1080p video capture and a 1.9MP camera up front. You'll also be treated to the same beautiful HD Super AMOLED panel with 1,280 x 720 resolution and a density of 267 ppi. In addition to the standard Verizon-specific LTE and EVDO radios, Verizon's Note contains quad-band (850/900/1900/2100) HSPA+ and quad-band (850/900/1800/1900) GSM / EDGE for global roaming capabilities. Our benchmark scores matched the other US variants, and in our real-world usage we enjoyed similarly smooth performance. Given that this device runs Project Butter (Android 4.1.1 Jelly Bean) and uses such a powerful chipset behind the scenes, we found that there's absolutely nothing to complain about in terms of performance. As we've come to expect on a Verizon smartphone, calls were clear, reliable and worry-free. In short, there was nothing about this model that stood out to us -- for better or worse -- when compared to our fellow Notes. We also found the battery life to match the expectations set by the original Note II; in our standard endurance test, which involves running a video on endless loop, we managed to get 10 hours and 15 minutes with LTE turned on, and heavy users will end up going to sleep at night with plenty of battery to spare. Anyone enjoying the Note II on a moderate basis should make it through almost two days before needing to charge up again. It's not too often we can seriously say that Verizon has one of the most enticing smartphone lineups in the US, but the addition of the Note II and HTC Droid DNA help convince us that the nation's most popular network has grown considerably over the last few months. Samsung's new device comes in marble white and titanium grey and has an asking price of $300 with contract. 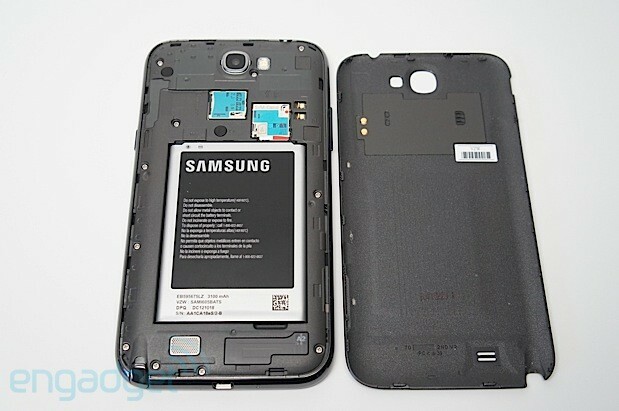 That puts it in the same pricing tier as the Motorola RAZR Maxx HD, another heavy hitter in the battery department. If you can forgive the smaller battery and lack of stylus, however, the DNA is a bit more tempting in that it offers a quad-core Snapdragon S4 Pro, wireless charging and a gorgeous 1080p HD display -- all for $100 less. Both powerhouses pack plenty of punch to please picky power users, which means you'll probably need a scale to weigh the decision facing you -- unless, of course, your thumbs are allergic to ugly logos and styli.